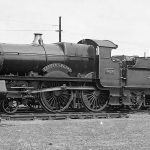 New steam locomotive honours Montgomeryshire | News by Wales Express News, People Before Profit! The ancient town of Montgomery and the former county that took its name are to be recognised in the form of a brand new steam locomotive. 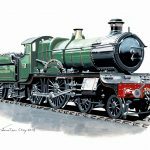 The Churchward County Trust (CCT) in Barwell, Leicestershire is in the process of constructing a full-size working replica of one of the Great Western Railway’s (GWR) ‘County’ class 4-4-0 locomotives, which will be named ‘County of Montgomery’. 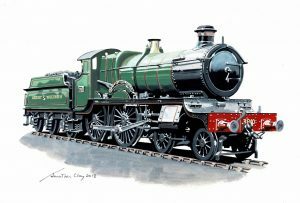 An artist’s impression of how the new locomotive No. 3840 County of Montgomery will look upon completion. Credit: Jonathan Clay, Churchward County Trust. The project, which comes 85 years after the last of these locomotives ran in service, is using a combination of original GWR components and brand new parts. The original 40 locomotives were built at the famous Swindon Works in batches between 1904 and 1912 and were named after Welsh, English and even Irish counties with which the GWR had links. A total of 11 were named after Welsh counties: Cardigan, Carmarthen, Monmouth, Radnor, Brecon, Carnarvon, Denbigh, Flint, Merioneth, Glamorgan and Pembroke. Why the GWR overlooked Montgomeryshire in the original naming scheme is unknown, but the CCT intends to right that historic wrong by naming its new locomotive ‘County of Montgomery’. One of the original GWR ‘County’ class locomotives No 3826 County of Flint. Credit: W. V. Wiseman/Rail Archive Stephenson. At the time of the original locomotives’ construction, Montgomeryshire was a stronghold of the Cambrian Railways, although the GWR did operate within the county, running services to Welshpool over the GWR/LNWR joint line from Shrewsbury to Buttington Junction. After the grouping of the nation’s independent railways into what became the ‘Big Four’ railway companies in 1923, the Cambrian Railways’ lines were absorbed by the GWR. Montgomeryshire found itself as a key component of the GWR’s route map, linking England with the Cambrian Coast and beyond. The frames for the new locomotive were cut on November 13 and the CCT already has many reusable parts salvaged from donor or scrapped locomotives, including the all-important boiler, as well as patterns for new components. However, there is still a long way to go before County of Montgomery takes to the rails! The CCT would be delighted to hear from anyone who wishes to support the venture. More information can be obtained on the website at www.churchwardcounty.org.uk or on the CCT’s Facebook page. Alternatively write to: Churchward County Trust, PO Box 10633, Leicester, LE9 0DU.